Our DIY leadlight overlay kits come complete with stick on lead strip, coloured window film, pattern and full instructions. Everything you need to learn how to create traditional looking leadlight windows in your home. 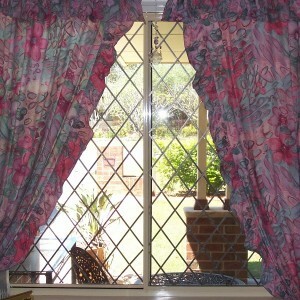 Each pattern can be adjusted to suit any size window by adding border lines to your design. Examples of how to create borders will be in your stained glass overlay kit. The kit designs you see here will suit windows 1m in size. You can purchase extra coloured film or larger lead rolls for borders if you have larger size windows. We will be able to guide you through the whole process and design ideas. New leadlight kits will be added here regularly, with themes in traditional stained glass, flora and fauna, marine, childrens patterns and more. So be sure to come back and see what new kits are available from time to time. If you have a special request please email me with your specifications and we will get back to you as soon as possible. Cottage window kit icludes- 1 roll50m x 6mm lead strip 1 boning tool 1 pattern sheet instructions w..